specifically for the managing of print quotes. 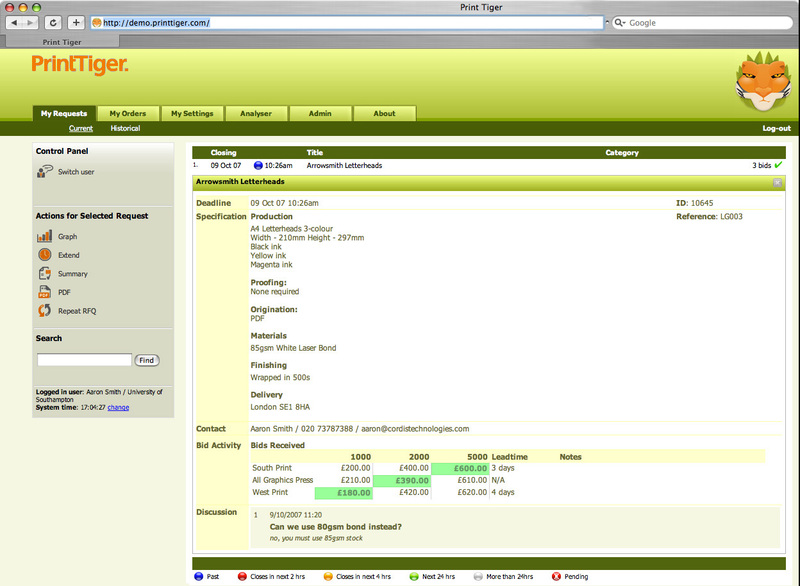 PrintTiger is procurement software developed specifically for the managing of print quotes. Completely web-based service, this new print procurement tool is every bit the solution your organisation has been looking for to minimise spend on printing and maximise productivity, as time wasted engaging in manual quote requesting and cost comparison, becomes a thing of the past. Print ordering can be unusually complex and doesn't always fit neatly in with larger enterprise procurement solutions. Not only do buyers have difficulty purchasing at the right market price, but have difficultly controlling where the work should be going. PrintTiger empowers the buyer, demonstrating savings anywhere from 10-20% on their print spend whilst reducing administrative overheads. A PrintTiger in the Tank! Print Media Magazine features a full page article on PrintTiger. The magazine talks specifically about how PrintTiger has enabled the University of Southampton to comply with EU-led contract regulations. Read it here. 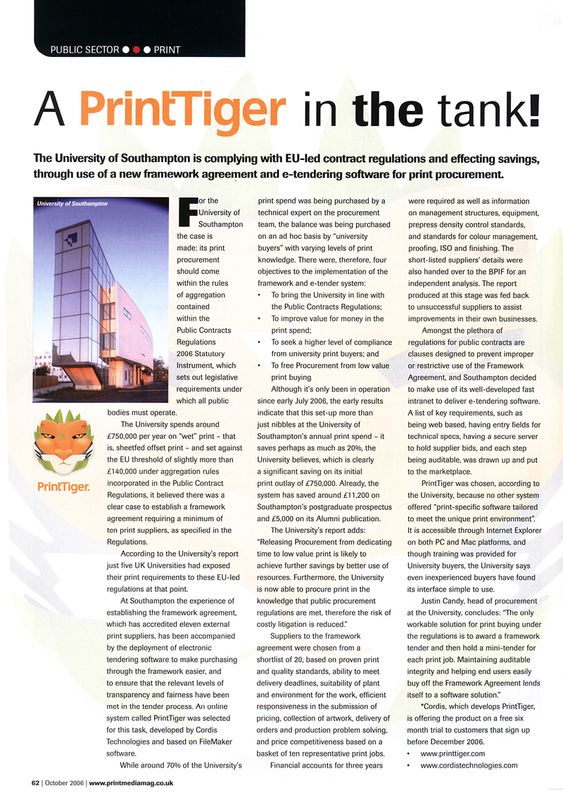 PrintWeek features an article about the University of Southampton's use of PrintTiger. Read it here. The University of Southampton has begun using PrintTiger to manage their circa £750,000 annual print spend across 13 suppliers. In the past 3 months the University has achieved cost savings that suggest a 20% annual reduction in print spend. Office Depot have continued their ongoing relationship with Cordis Technologies (the software developers who created PrintTiger), by adopting the application to manage their clients' print spend. PrintTiger empowers the buyer, demonstrating savings anywhere from 10-20% on their print spend whilst reducing administrative overheads. PrintTiger adheres to the Public Contracts Regulation 2006; ensuring public sector organisations are legally compliant.